On March 4th in 1928 199 runners set out from Los Angeles to race to New York and claim a prize of $25,000 for first place. That was quite a lot of money at the time, a policeman would earn about $40 a week. In fact that is still a lot of money now, I estimate that is what it will cost me to do this. 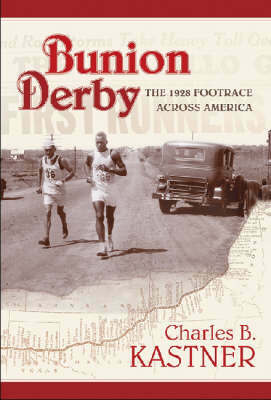 I first heard about this race by reading The Bunion Derby, a fantastic book about the race (link goes to google preview). It is an account based on newspaper reports spanning the 84 days and 3400 miles of the race. Things were very different then. The twenties in the USA was in interesting decade. An economic boom and huge rises in personal income for many which led to some crazy behaviour. Drinking alcohol was illegal and people expressed themselves in funyn ways, such as by 24 hour dancing, week long flag pole sitting and swimming for days. People seemed to go mad for the endurance challenges. Charlie C Pyle, more of a circus promoter than an endurance enthusiast saw this as an opportunity to make his name (and some money do doubt as was the theme at the time) by promoting what he called "The Greatest Show on Earth" (he was a modest chap). He offered a large prize for runners who (for $100 deposit) could run along the newly built (and in many parts not quite built) Route 66 from LA to Chicago and then across to New York. Strangely enough it probably seemed like a fairly normal thing to do 70 years ago, more so than now. I don't want to go into detail of the book (or spoil the ending) and I recommend you all read it and I challenge you to not want to follow their footsteps on finishing the book. There are however a few things that just stood out for me when reading. They were actually running quite fast. Quite often I'd read something like "So and so won the 38 mile stage averaging 8 miles an hour". 8 miles an hour for 38 miles when you've already run 2000? That would be the kind of time I would do if I just tried to run that distance once at full speed and did not have to get up for the next week. America is enormous. Well, not just the distance but the geography that you have to run through. The route goes through the hottest desert, mountain ranges, great plains where the winds are so bad that trees grow sideways. Everyone was so young. There were a lot of people in their 20s. There was one kid who was 15 and got halfway before this was discovered and he was kicked out. There were not many over 40. Next year there will be not many under 40. I actually found out what a bunion is. I thought it was like a callous or something but it is actually quite severe muscle contortion in the foot. I don't want to get that. The winning time was 573h 4m 34s. That is a long long time. And why on earth were they measuring the seconds?